A Valentine card to send to a very dear friend. This card I designed around the designer papers and I am quite happy with the outcome. I started by die cutting the bottom panel with the wonky rectangle die and attaching it to my card base. 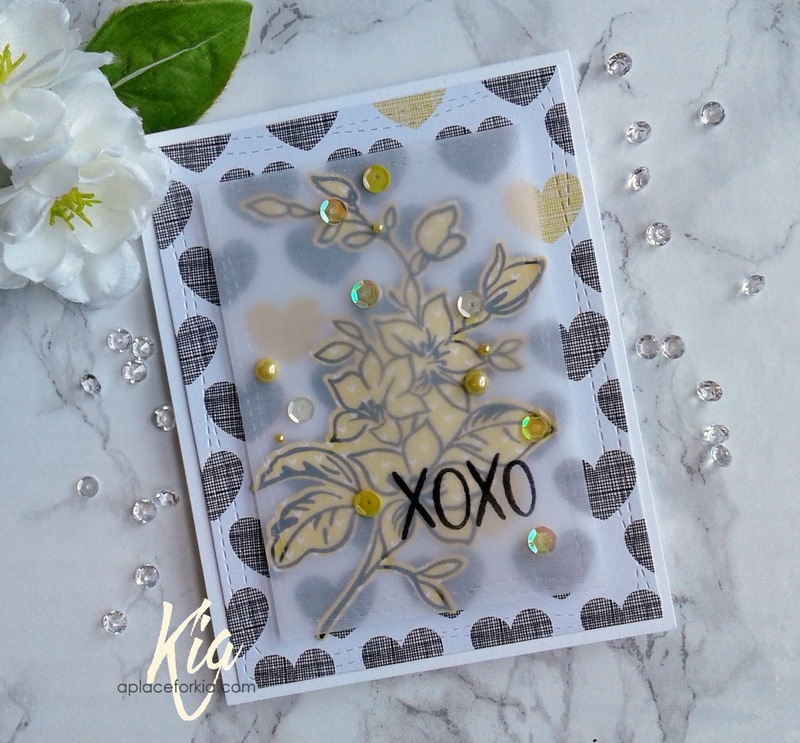 I then stamped the flower image on the yellow heart paper, heat embossed with black embossing powder, then die cut with the coordinating die. I attached it to the card using foam tape. The vellum is die cut using the smaller wonky rectangle then stamped and heat embossed again using black embossing powder. I attached it to the flower using multi matte glue and a toothpick applying the glue to the black embossed area of the flower so it would not show through the vellum. And being the "embellisher" that I am, I finished with sequins and pearls. I hope you enjoy this card and thank you for visiting my blog. Products: Altenew Best Mum Stamp and Die Set, Simon Says Stamp Really Like You Stamp Set, Simon Says Stamp Wonky Rectangles, Neenah Classic Crest Solar White Cardstock, Lawn Fawn in the Meadow Designer Paper Pack, American Crafts Plus One Designer Paper Pack, Foam Tape, Ranger Multi Medium Matte Glue, VersaMark Embossing Ink, Black Embossing Powder, Sequins, Kaiser Pearls.